Atlanta Network Systems has continued to support our friend Jim Burton and his battle with amyotrophic lateral sclerosis (ALS), also known as "Lou Gehrig's Disease". ALS is a neurodegenerative disease that affects nerve cells in the brain and spinal cord. We have been incredibly fortunate to watch Jim continue to thrive as a leader and author despite his condition. 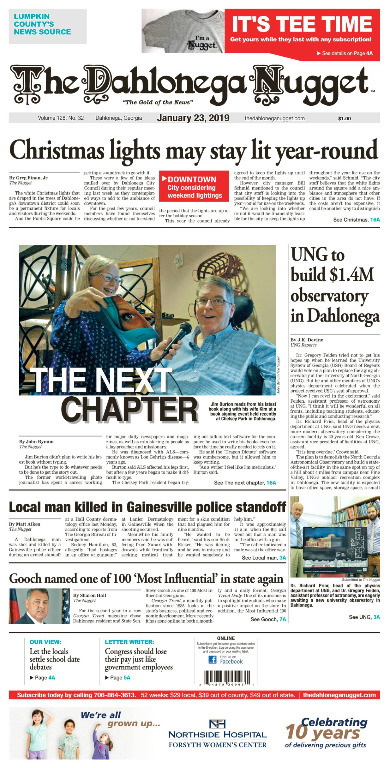 The Dahlonega Nugget recently highlighted the release of his new book. Here is what they had to say! Jim Burton didn't plan to write his latest book without typing. But he's the type to do whatever needs to be done to get the story out. The former world-traveling photo journalist has spent a career working for major daily newspapers and magazines, as well as ministering to people as a lay-preacher and missionary. He was diagnosed with ALS, commonly known as Lou Gehrig's disease,6 years ago. Burton said ALS affected his legs first, but after a few years began to make it difficult to type. The Chelsey Park resident began trying out talk-to-text software for the computer he used to write his books even before the time he really needed to rely on it. He said the "Dragon Dictate" software was cumbersome, but it allowed him to keep writing. "As a writer I feel like I'm meticulous," Burton said. He said that when writing a 60,000 word manuscript, mistakes can get lost. "With experience you get better at using the software. It learns your voice and cadence and your vocabulary," he said. Burton, who has published books about living life according to God's guidance, turned his attention to the subject of ALS in his 2014 book Life in the Blue Zone. But more recently, he has turned his attention to fiction. He recalled reading many John Grisham novels and thinking that he could write in the same genre. His latest book is called Ransomed. Burton said it is the story of a couple whose baby is kidnapped with plot twists that include real-world issues such as terrorism, but also Christianity. He said readers will understand the cover photo much better after they read it. Family, friends and fellow Chelsey Park residents gathered to celebrate the release in Dahlonega last week, where Burton proudly read from his book and answered many questions about it. The book is the first in a series to be published. Burton said that during his career, his camera has taken him around the world, including 18 countries and four territories. He recalled a particularly harrowing trip he experienced as a photographer with a missionary team traveling to Iran on a C130 plane. When the group landed in Sanandij, Burton said their plane was circled by military personnel with machine guns. Ultimately they reached the refugee camp to bring aid to the Kurdish people. Burton spent his career traveling to locales such as Japan, Hong King, Korea, Russia and the Middle East. Later in his career he moved to Forsyth County where he spent more time as a minister to several area churches. He said he is happy to say he doesn't have regrets in life, as he as been fortunate to travel widely and have many experiences. The link to Jim's new book is below! Enjoy!